In my neck of the woods lobsters have been very reasonable. For me lobster usually enjoyed outside after a day in the sun with a cold beer...but I thought I'd do something a little different this time (but still with a cold beer of course)! 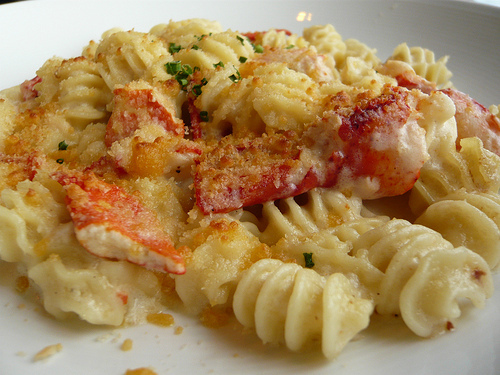 This lobster mac & cheese is rich and decadent from the cheese and sweet and succulent from the lobster which makes for a perfect combination! Preheat oven to 375 degrees and coat deep pie plate with cooking spray. Cook noodles according to package instructions for al dente and reserve until later. In a medium nonstick sauce pan, melt butter. Once melted, add cream cheese and 1/2 cup half & half. Reduce under medium to low heat until a smooth mixture forms. Whisk in remaining half & half. In a small bowl combine flour with white wine and whisk until smooth. Whisk into the half & half mixture in sauce pan. Bring to a gentle boil until sauce thickens. Remove pan from heat and stir in cheeses, Tabasco and pepper if desired. Continue to stir until cheese has melted. Pour sauce over reserved noodles and stir in lobster. Spoon mixture into prepared pie plate. In a small pan heat olive oil until hot. Stir in minced garlic and cook about 30 seconds. Stir in bread crumbs and continue to cook until breadcrumbs are toasted. Sprinkle over the macaroni & cheese and bake uncovered for about 20 - 30 minutes.